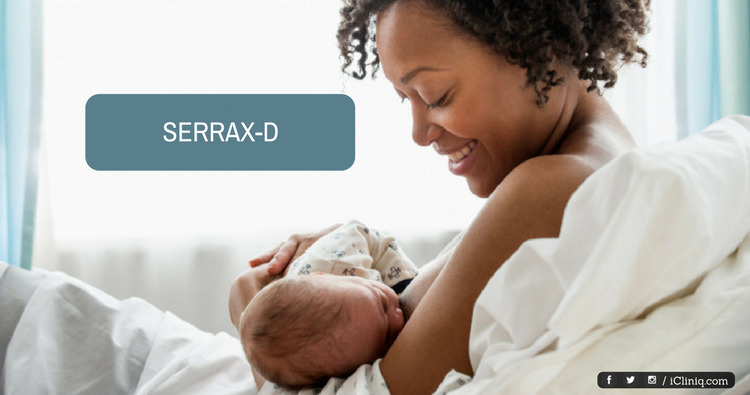 Can my wife use Serrax-D while breastfeeding? iCliniq › Ask a doctor online › Answers › Child Health › Breast Feeding › Can my wife use Serrax-D while breastfeeding? Q. Can my wife use Serrax-D while breastfeeding? My wife is 27 years old. Her weight is 60 kg and height is 5'4". She developed a wound on her left thigh a few days back. We ignored it at first. Later, the surrounding area started swelling. Now, the swelling has reached till the lymph nodes. We went to a gynecologist here. She told that lot of infection had developed. The doctor prescribed Taxim-O 200 (Cefixime) to be taken in the morning and night along with Metrogyl 400 (Metronidazole) three tablets a day and Serax-D (Serratiopeptidase and Diclofenac potassium) to be taken in the morning and night. My wife is currently breastfeeding our 5 months old baby. So, we asked the doctor whether those medications are safe during lactation. She told that it is fine. However, based on what I read on the internet the first two tablets are moderately safe during lactation and may not pose any significant risk to the baby, whereas the third one is contraindicated during lactation. As per the doctor, the third medicine is required for her cure and is safe to take. Can you let me know whether the medications are safe to take during lactation? Can my wife continue breastfeeding normally? Our baby does not take powder milk and was vomiting when we tried bottled milk in the past. We need your valuable inputs. My wife does not have any other medical conditions. Our baby was born underweight (2.2 kg) and is currently 5.4 kg. Other than the low weight, she is usually active. • My tooth infection has spread to roots. Please tell me a solution. • My face has swollen after a gum abscess. Should I be worried? • Are antibiotics necessary to cure wisdom tooth infection? The drug Serax-D, a combination of Serratiopeptidase and Diclofenac potassium should not be advised in case of pregnancy or with lactation. Although it does cause problems like diarrhea, bleeding and rash, data is lacking regarding safety in such kids. This may be the personal experience of your gynecologist, as they may not have seen any bad effects and so they are using it. But, according to literature, we should not use it. There is no clear indication of this medicine in your case. Use of antibiotics and analgesics can heal the wound. So, my conclusive advice is to stop Serratiopeptidase and continue the rest of the medicine. Please discuss my opinion with the treating doctor and stop the medicine with consent. A little advice for the baby's weight; breastfeed her until six months of age. Do not use formula feed. After six months, start a cereal-based diet to ensure adequate weight gain. My head feels numb after a slip and fall. What should I do? I am having tooth pain because of broken tooth. Please help.